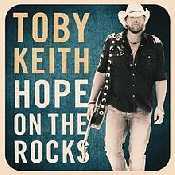 Hope On the Rocks es el titulo del álbum número 16 del cantante de Country Toby Keith. "I Like Girls That Drink Beer" es la canción elegida Como primer single . 1. "Hope on the Rocks"
2. "The Size I Wear"
6. "Haven't Had a Drink All Day"
7. "Haven't Seen the Last of You"
9. "Missed You Just Right"